On the run, but powerless, Buffy and Willow have to take on the government in order to make things right again for supernatural beings. But with the help of their friends and family, maybe it won’t be so hopeless after all. We start off with Dawn and Xander packing, though they’re not sure of what they might need since Buffy hasn’t told them the plan yet. But these two are nothing if not adaptable, so they take what they can and head out to the meeting point. Meanwhile, Faith is trying to protect Buffy and Willow from the other Slayers, since they don’t have their powers anymore. If they fail, Dawn and Xander will be waiting alone and the world of supernatural beings will be doomed. Thankfully, the situation improves fairly quickly. Buffy helps Faith with the attackers while Willow gets into the control room. 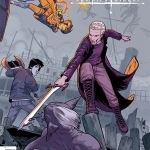 The witch manages to power up in order to help the fight, along with returning Buffy’s power as well. 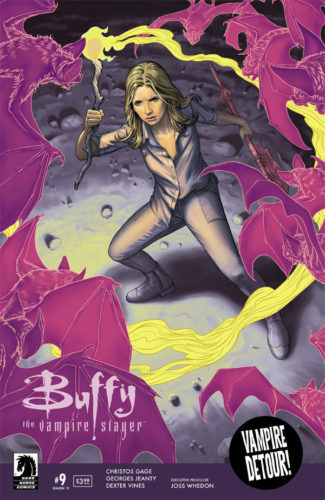 And with Faith returning the Scythe to Buffy, all feels right again. Now they can fight with all their skills at the ready. In order to hurry things along, Willow goes through the computer and figures out where to go next. She cloaks them and gets them close to the building that is powering the generator for the force field, but they need to get inside. Willow proceeds to drain her full power by taking down the force field and bringing the soldiers to them for a confrontation. Before things can get too messy, though, all the monsters break out of the now-downed force field and create a distraction. That also means Spike can return to his rightful place alongside Buffy and they can take on the big bad together. To make their escape, Faith hot-wires a jeep and they head out to meet Xander and Dawn in a motel in Santa Fe, New Mexico. Upon arrival, they see on the news that the press secretary has announced about the escapees from the Safe Zone and how the vampires have attacked the population of Dolan Springs, Arizona now that they’re free. This puts all vampires in danger of being killed now, including Spike, as the President has authorized lethal force. 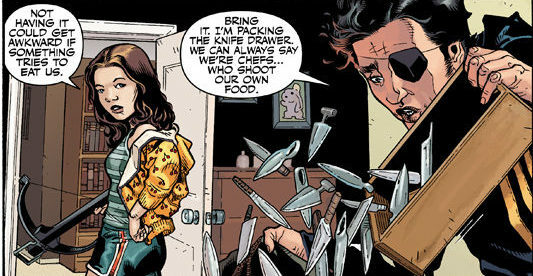 Buffy needs to figure out a fix for this and soon. First step is tracking down Vicki, as she was shown as one of the attacking vampires in the news video. Two days later, Spike is in Austin, Texas at the Congress Bridge, which is home to the largest urban bat colony. He lures Vicki out and then Buffy, Willow, and Faith attack. But what should have been a straightforward payback turns complicated when Vicki says that she did not kill the population, as it appeared. There was no blood on her fangs in the news footage. It appears they were made scapegoats by the government in order to justify the increased violence against supernatural beings. If they’re going to get anywhere, they have to work together. Buffy explains about the machine that drains magic, how the bigger plan is to launch the machines up on satellites to drain magic more widespread. She sends Vicki and her group east, to hopefully lure the soldiers in that direction, while the Scooby Gang head to San Francisco, where everything made at the camp is being delivered for the Pandora Project. 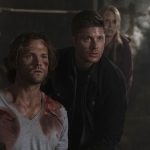 They’re going back to the start, and hopefully they can finally finish this in order to make it safe for supernatural beings once again.